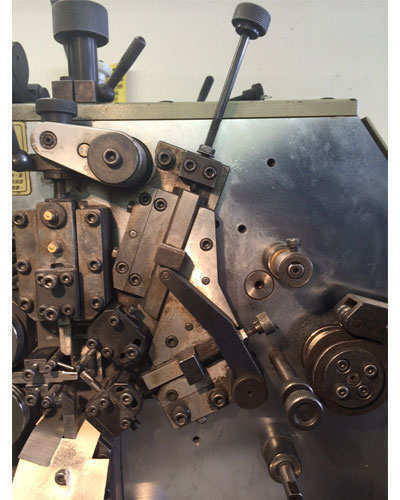 The process to make and manufacture compression springs is provided in this page along with pictures and examples of how it is done. We also provide you with compression spring design guides, our spring calculator, and the opportunity to contact our spring engineer to help you with your design. Whether you’re on the page just looking to find out how springs are made or are looking for a company to manufacture your company’s coil springs, you’ll find all the information you need here, at Acxess Spring Company. There are many factors to designing a compression spring which you may investigate by clicking here. The basics on how to make a compression springs design are the physical dimensions, loads, rate, and travel requirements. Take your compression spring’s surroundings into consideration to figure out the physical dimensions. For example; if your spring is going inside a hole, you must consider the outer diameter and if your spring is going over a shaft, take the compression spring’s inner diameter into consideration. Make sure you allow some clearance between the walls of the hole or shaft and the spring so that you avoid friction by when the spring is in motion (deflecting). To work on the other values like load, rate and travel, we also have various pages explaining maximum spring compression, load, and compression spring rate. When picking a material type, you want to make sure that it will be able to resist the conditions of whatever environment your spring will be facing. The factors to be taken into consideration are both temperature and other environment characteristics like moisture or contact with certain chemicals. This spring must be resistant to all of those factors. You don’t want to over do it though. The higher the heat resistance of the spring, the more expensive the material type. Click the link to get more information on the properties of common spring materials. Feed Rolls: The feed rolls are those two rolls shown in the images provided. These roll simultaneously to feed the wire from the first wire guide to the second wire guide. This tool is selected accordingly to the wire diameter. Wire Guides: There are two wire guides. One before the rolls, and the other after the rolls. The second wire guide feeds the wire towards the arbor to begin shaping the coils. This tool is also selected based on the wire diameter. Arbor: The arbor is the half-moon-shaped pin which the wire goes under and around once it has hit the coiling points. This tool is selected based on the compression spring’s inner diameter. Coiling Points: The coiling points are two pins which shape and form the coils by interfering on the spring wire’s straight path and slightly making a continuous bend. Pitch Tool: The pitch tool is a bar that slides up and down to also interfere with the now coiled wire. This pushes the coil out to make pitch. Cutter: The cutter comes down once the spring is formed and cuts the wire where the last coil ends therefore completing the process. In order for us to make a compression spring, the material must be soft so they need to undergo a heat treating process in order for the material to harden and work as expected. If the springs aren’t heat treated, the material will stay soft and the spring will automatically take a set if it is compressed because it will not have any force or memory within its coils. The springs are heat treated at different temperatures and for a different amount of time depending on the material type. To learn the temperatures a certain material type is heat treated at, click here. After the springs have been heat treated, we check that the compression spring dimensions are in line and that the rate and working loads can be met. We have to check such things because some spring materials shrink or expand after the heat treating process. This affects the coil diameters, the free length, and the total coils. This process is done repeatedly throughout the making of the springs; first to make sure the set up is correct and also to make sure that the spring will have all the right dimensions after being heat treated.